Darmstadt is a large sized town in the south of the Rhine-Main area. On the yellow signposts on the outskirts of the town a message is proudly displayed: “Darmstadt the Science Town”. There area many students at the Institute of Technology and among them are many Chinese students. 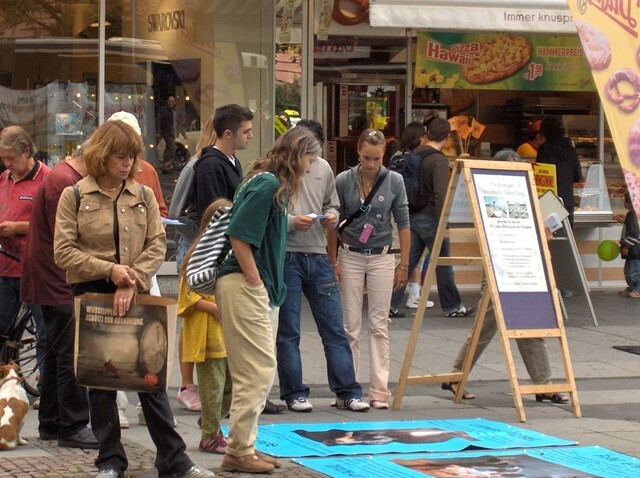 Therefore, some Falun Gong practitioners in Germany chose to hold an activity there to let people know about the persecution of Falun Gong. 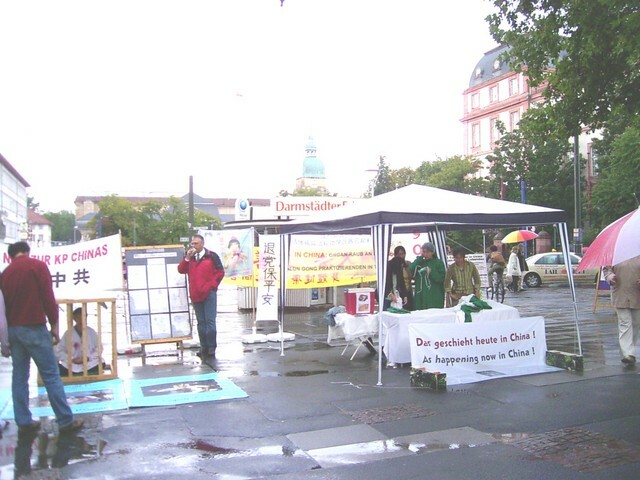 From 11 a.m. to 6 p.m. on the 26th of August, practitioners from Darmstadt organised a demonstration exposing the organ harvesting from practitioners in China. Additionally, the organ harvesting and torture of practitioners in a cage was re-enacted. 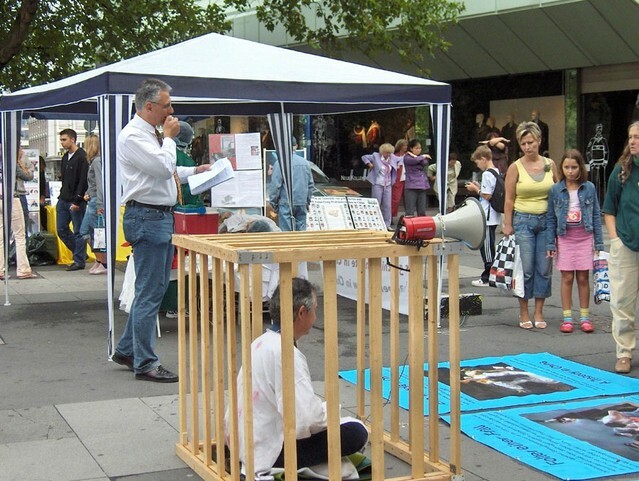 Falun Gong artists brought pictures that depict torture scenes suffered by Falun Gong practitioners. 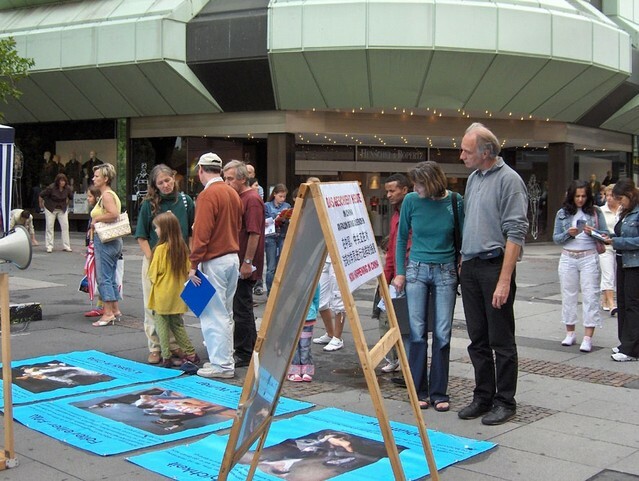 This demonstration was taking place in a busy pedestrian zone opposite the white tower in Darmstadt. Many Chinese and German practitioners came from other cities to help out. We experienced a heavy rain shower when we began to demonstrate the crime of organ harvesting from live Falun Gong practitioners. The Chinese practitioner who was playing the doctor was soaked through. Despite this, we continued without blinking an eye. Despite the rain, the people stopped to listen to us. The people who passed by and stopped at the exhibition were deeply touched and many were shocked about the atrocities going on in China at this time. Many signed our petition after we had called on them to show their support by signing the petition against the organ harvesting of practitioners in China over the microphone. One man was enraged. He had already been involved in activities about the oppression by the Chinese Communists. He collected as much material as we could give him and took it with him. He said, “You have to put greater pressure on business managers who do business with the Chinese, as well as the German politicians. Furthermore, I’m very disappointed with our former Chancellor Schröder. He only had economic benefits in mind and disregarded completely the human rights violations in China. There were many children who wanted to immediately sign the petition after viewing the cruel torture displays and pictures. A young boy around eight years of age and his older brother stayed for half an hour and wanted to have everything explained quite clearly. I introduced him to Xiong Wei, a practitioner who was imprisoned for two years in a slave labour camp in China, but regained her freedom due to a worldwide, but Germany-focused, signature campaign. I wanted to show him that such campaigns are also quite effective and successful.